Providing transportation to Hortobágy. Taxi, Bus, Limousine Service. Transfer from/to Budapest - Hortobágy. The Great Hortobágy Inn and its surroundings are the natural centre of the Hortobágy. The first inn was built here in 1699, then came a new Baroque inn that subsequently gained a Classical exterior. It functions as an inn to this day. 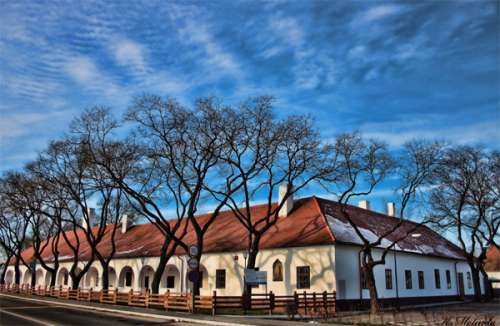 In the summer of 1699, the town of Debrecen had a public house built beside the post station at the bridge near Máta (Máta is now a part of the town of Hortobágy), where the innkeeper was also charged with collecting the toll. That was the predecessor to the current Hortobágy Inn. The increasingly busy inn was first expanded and then, in 1781, the building of a completely new and more spacious inn was decided upon. There were two rows of rooms in the new Baroque-style building, with three rooms to the north and two to the south. In the middle was the open-fired kitchen. The entire interior was built in a Baroque style with a gently arching coved vault. That building, again due to the rapid increase in traffic, soon required expansion. In the 1830s, it was enlarged in the Classical style that was prevalent in the Debrecen of the day. The southern facade of the enlarged inn was ornamented with an arcaded corridor with 15 arches, two of which were subsequently walled up. The Hortobágy Puszta is a geographical definition open to broad interpretation. It was not until the 1820's and 1830's that the collective term of Hortobágy Puszta was used for the properties and meadows along the River Hortobágy that belonged to Debrecen. 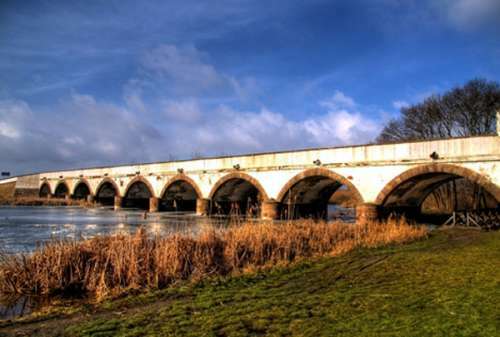 The settlement and its surroundings are an outstanding tourist centre. 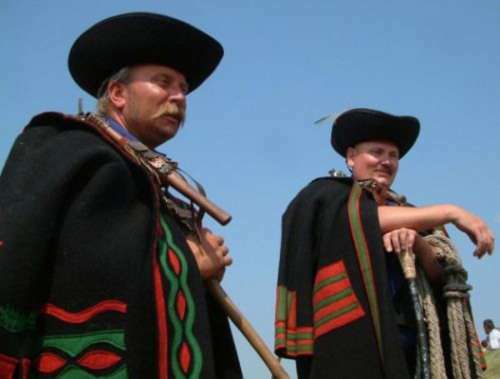 Most visitors interested in the puszta begin their journey here to discover the natural assets and examples of folk architecture of the Hortobágy. Sculpture group of water bearers by the Nine Hole Bridge. 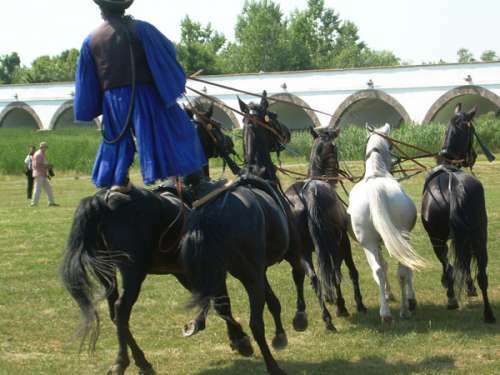 An annual traditional 'puszta' event is the Hortobágy Bridge Fair (Hídivásár) held here from 18th to 20th August on the area opposite the Nagyhortobágy Inn. 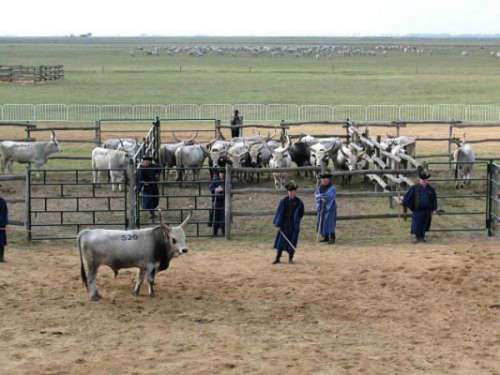 It has become a tourist spectacle where one may purchase unusual folk art pieces. 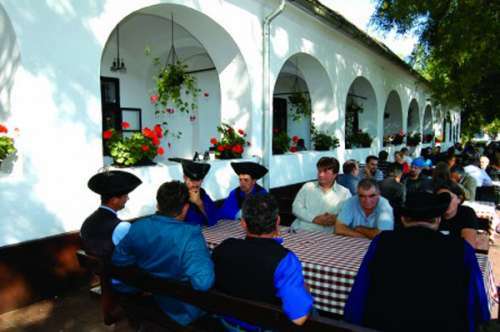 Approximately 2 kilometres from the centre of Hortobágy, Máta is the home of the famous Hortobágy studs. 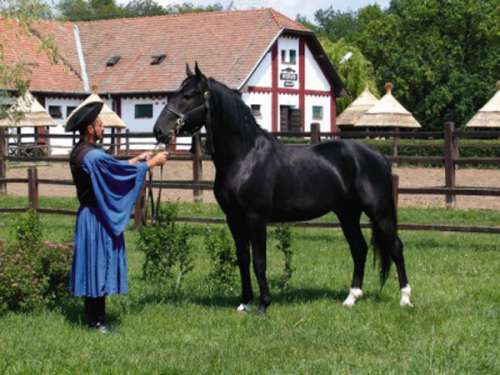 Nonius horses have been bred here for over 300 years. 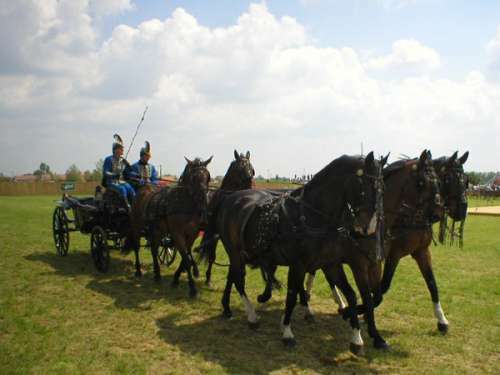 On the first weekend of July the Hortobágy Equestrian Days (Lovasnapok) are held here. Travellers particularly enjoy the horse and cart rides that provide also a great opportunity to discover the natural assets of the Hortobágy. Bicycle tours are another excellent option for exploring the region. The local inns are traditional stops for visitors of the Hungarian Great Plain, some of them built ages ago along busy roads. 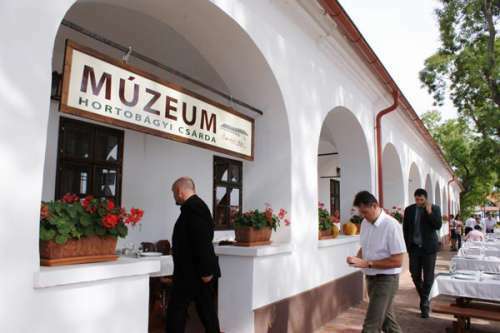 In the 19th century some 40 roadside inns were established around the territory of Hortobágy. Along route 33 that crosses the puszta between Tiszafüred and Debrecen, a few of those 'csárda' inns still operate.